Reynolds is a bowler and hedge fund trader and member of the Fund Bunch. The Pin Pals played against the Fund Bunch in a bowling game. Reynolds acted like a rich jerk and would throw cheese burgers at Harold, a nerd bowler. After the Pin Pals won their first game, the Fund Buch treated them to dinner. At dinner, Reynolds was horrible to Moe, causing him to break down. 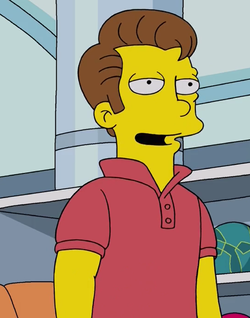 He then made a deal with Moe so that he would get Moe's Tavern and Moe's name if the Fund Bunch won. If the Pin Pals won, the Fund Bunch would have to give them an experience only rich people could do. It then turned out that the Fund Bunch had played them and they were a lot better at bowling than they let on and beat the Pin Pals in their next game. Meanwhile, Lisa was helping the nerd bowlers get revenge on the Fund Bunch. They found out that Reynolds would lose his job in the future to artificial intelligence. The Fund Bunch then lost the last game. Modified on November 21, 2017, at 15:59.